Wear Star Wars Every Day auctions: new batch is up! Just in time for the 40th anniversary of Star Wars, it’s the new batch of #WearStarWarsEveryDay auctions. I’m turning apparel items that were donated for me to wear in my charity fundraising campaign for Collateral Repair Project into an additional way to raise funds for them to continue providing assistance to refugees. In the first batch of auction items, the two Star Wars Celebration exclusive shirts sold, raising $81 for Collateral Repair Project. Don’t forget to check out the fundraising results & breakdown of what I wore in the main wear-a-thon of my Wear Star Wars Every Day fundraiser – we raised over $7,900 for Collateral Repair Project. It’s almost the 40th anniversary of Star Wars, so while everyone has Star Wars on the brain, time to check in to see how the Wear Star Wars Every Day fundraising campaign did! In the last nine days of 2016, #WearStarWarsEveryDay raised over $2,800 for Collateral Repair Project from thirty-eight donors, which put the total amount raised at $7,935.50. Talk about a big finish! The month of December alone saw donations totaling over $3,800 or nearly half of the total of the project – it looks like everyone was waiting to see if I would make it to the end of the year with my goal of wearing a different Star Wars apparel item every day! We even had a donor chip in the equivalent of a dollar a day! I greatly appreciate everyone’s contributions and I know that Collateral Repair Project also greatly appreciates everyone’s generosity. I’m amazed that we were able to not only cross the $5,000 threshold in week 51, but we just kept getting donations to push us over $7,500 total, and over $6,000 on the GoFundMe. Just to put it into perspective, $7,935.50 is enough to have Collateral Repair Project provide food for 100 families of four for a month plus purchase 100 sets of school supplies for kids plus purchase 75 mattresses for adults. Still want to make a contribution? You can still help us out by donating at the Wear Star Wars Every Day GoFundMe page, or purchasing Wear Star Wars Every Day apparel up for auction on ebay. Here’s a quick breakdown of what I wore for Wear Star Wars Every Day. Every day I wore a different Star Wars apparel item, from shirts to hats to costumes to baby clothes – one new item each day, with a bonus item on one day for a total of 367 articles of clothing. We had 3 aloha shirts, 1 bandanna, 3 baseball jerseys, 1 belt, 3 bowling/racing shirts, 2 button down shirts, 5 costume or costume pieces, 1 cover, 1 dress, 1 happi coat, 17 hats, 2 henleys, 1 hockey jersey, 2 long-sleeve shirts, 5 baby onesies, 1 pair of pajama pants, 2 polo shirts, 1 scarf, 1 set of shoelaces, 1 skirt, 2 soccer jerseys, 4 and a half pairs of socks, 1 pair of sweatpants, 9 sweatshirts/sweaters, 2 tank tops, 1 necktie, 2 work shirts, 2 wrist sweatbands, and 288 t-shirts. Overall, I wore 3 items from Adidas, 5 from TeeFury, 6 from We Love Fine, 9 from Teepublic, 12 items from Her Universe, 13 from Disney (or runDisney), 21 items from Fifth Sun, 21 items from Mad Engine, and 36 official Star Wars Celebration items (covering all the Celebrations as far, except CII). Items came from Ireland, Mexico, Jordan, Germany, Malaysia, Japan and the UK. We had a small number of items from the 1970s and 1980s, a few more from the 1990s, but most from the 2000s and present. All kinds of stuff covered, from individual movies to books and video games and even the Ewoks cartoon, Star Wars In Concert, and the canceled Detours animated series. Items from fan groups included 6 items from Rebel Legion and 23 items from the 501st Legion as well as from about ten different podcasts and sites. Some of our biggest lenders/donors of apparel are Ian Camaclang (5+ donated), Todd Felton (10 items lent), Margaret Mays (12 lent), Ryan Chung (12 lent), Tom Mascari (12 lent), Kristen Hidalgo (10 donated, 2 lent), Mediocre Jedi (13 lent), Brian Sims (13 lent, 1 donated), Danielle Janda (15 lent), James Sebree (18 lent), Paul Farquhar (25 lent). For the final push in late December (12/21 to 12/31), I had offered some cool prizes in a random drawing of donors, and we had a lot of donors in this time frame – almost fifty! A set of four Star Wars Topps trading card series books donated by Abrams ComicArts, including two signed by the series editor, Gary Gerani. Winner: Lillian N.
A set of four Star Wars Topps trading card series books donated by Abrams ComicArts, including two signed by the series editor, Gary Gerani Winner: Annalee H.
Star Wars: Ahsoka novel signed by both the author, E. K. Johnston, and the voice of Ahsoka Tano and audiobook narrator, Ashley Eckstein. Winner: Susan D.
LEGO Star Wars: Chronicles of the Force, signed by authors Cole Horton and Adam Bray. Winner: Amy F.
Star Wars: Maul: Lockdown Advance Uncorrected Proof by Joe Schreiber. Winner: John V.
Star Wars: Aftermath: Life Debt audiobook on CD, written by Chuck Wendig, read by Marc Thompson. Winner: Trina G.
Star Wars: The Original Topps Trading Card Series, Volume One donated by Abrams ComicArts. Winner: Christine M.
Star Wars: The Empire Strikes Back: The Original Topps Trading Card Series, Volume Two donated by Abrams ComicArts. Winner: Terry F.
Star Wars: Return of the Jedi: The Original Topps Trading Card Series, Volume Three donated by Abrams ComicArts. Winner: Michael W.
Star Wars: Catalyst: A Rogue One Novel hardcover by James Luceno. Winner: MC Y. Star Wars: Heir to the Jedi paperback by Kevin Hearne. Winner: Maia M.
Big thanks to everyone who donated in the Week 52+ timeframe (from Dec 24 on into 2017): John V., Jennifer Q., Kyle L., Jazz K. R., Shehryar S., Nerf, Mediocre Jedi, Amy F., Tara M., Nick D., Oei One, Lillian N., Anonymous, Yav, Gerard T., Anonymous, Lynn N., Anonymous, Gregory H., Tom H., Diane O., Cyndi G., Brian C., Tony B., Chickaphant, Eliz, Anonymous, Lillian N., Amy W. N., Trina G., Christine M.-K., Holly F., Patricia B., Caitlin S., Michael W., Maliha S., and Margaret M. Also thanks to Ian for donating a shirt worn in week 52, and Dani and Stuart for lending me apparel for week 52. The final nine days of 2016 covered the holidays and some of my favorite Star Wars clothing items. We had a scarf, a Christmas-themed shirt, a shirt that was a Christmas present, and finished the year with my favorite Star Wars hat, a Captain Rex cap from The Clone Wars, and an Ewok aloha shirt. Every day I wore a new and different Star Wars apparel item, my daily pledge makers will chip in $4.65 to Collateral Repair Project! This review for Week 52 covers December 23 to December 31 of my wearathon, and an update on fundraising for Collateral Repair Project, a non-profit organization that provides emergency assistance, education, and community support to urban refugees. With many borrowed and donated items still unworn, I unofficially kept my streak continuing for another two weeks into January, which can be tracked on this album of the Wear Star Wars Every Day Facebook page and ended with a Baze Malbus running costume. Get more info on what Wear Star Wars Every Day is all about, or make a donation via GoFundMe. Time for some Wear Star Wars Every Day auctions! While I finished up the wear-a-thon part of my Wear Star Wars Every Day charity fundraising project after completing the entire year of 2016 by wearing a different Star Wars apparel item each day, the project is now moving onto a new phase with extra fundraising through the auction of donated clothing. Starting us off for Star Wars Day and the first week of May, we have five t-shirts and a hat up on eBay for folks to bid on. Or you can just donate directly to the Wear Star Wars Every Day site to benefit Collateral Repair Project, a non-profit that provides emergency assistance, education, and community support for urban refugees in Amman, Jordan. Wear Star Wars Every Day: Week 51 & Final Drive! We’re currently on the final week of the #WearStarWarsEveryDay fundraising campaign for Collateral Repair Project and we had a fantastic week 51: over $1,000 raised in just the week from December 16th to 23rd, from sixteen donors! I put out a call to bump our total over $5,000 and you responded – by the end of week 51, we’ve raised over a total of $5,064 including the GoFundMe and offline donations. And we’re keeping the momentum going, hoping to push the Wear Star Wars Every Day GoFundMe alone over $5,000 – and as of 12/27, we only need $300 more to do it, so make your contribution today, before the year ends! Did I mention cool random prizes as a thank you? Yes, yes I did. In probably our biggest week of fundraising yet, I’d like to thank a whole bunch of folks for donating to Collateral Repair Project, and I want to start with Mediocre Jedi, who issued a Twitter challenge. For each retweet he got about his challenge for helping Wear Star Wars Every Day within 12 hours, he would donate a dollar, and that added up to $162 raised! Also big thanks to all these other donors: Ian, Anonymous, Stuart, Nancy, Maia, a different Anonymous, Charity, a different Ian, Miguel, another different Anonymous, Linda, Leah, Annalee, MC, and Brendan. Wow! That’s a lot of thoughtful and generous people. Plus I’m grateful for Dunc and Lillian donating some wear for this week, and Annalee and Stuart lending some cool threads. We went from celebrating the release of Rogue One to some outerwear to mark the start of winter this week, with shirts, a custom-made cover, a fleece and a Poe Dameron pilot costume jacket (courtesy of Baby Jawa). Every day I wear a new and different Star Wars apparel item, my daily pledge makers will chip in $4.65 to Collateral Repair Project! This review for Week 51 covers December 16 to December 23 of my wearathon, and an update on fundraising for and the latest happenings at Collateral Repair Project, a non-profit organization that provides emergency assistance, education, and community support to urban refugees. Plus, there’s soon going to be a way to help support Collateral Repair Project beyond 2016 – Soon, I’ll be putting up donated apparel on eBay with proceeds going directly to CRP. 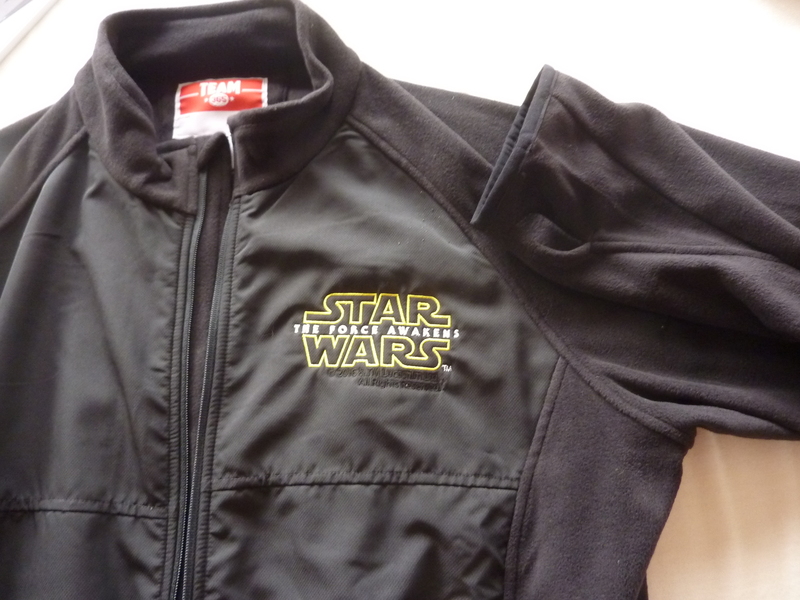 So this might be your chance to get your hands on some of the really rare threads I’ve worn that were donated to the project, including this week’s STARZ The Force Awakens fleece. Stay tuned! 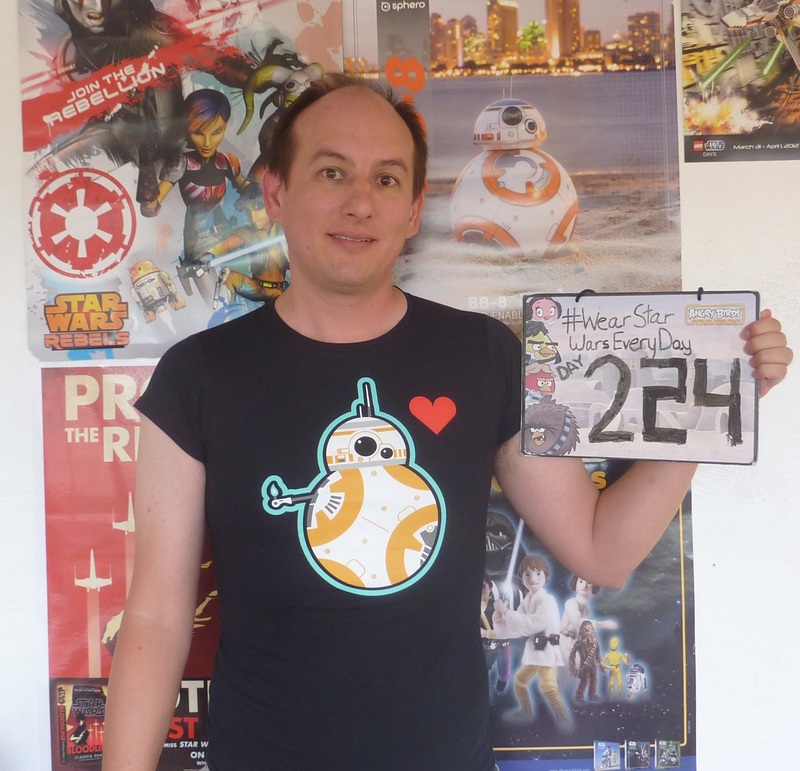 Wear Star Wars Every Day: Weeks 49 & 50 and the year end final push! My #WearStarWarsEveryDay fundraising campaign has surged into December, and has plenty of cool looks in the lead up to the opening of Rogue One. Since I was so busy with preparing for my local Rogue One premiere event, I wasn’t able to assemble a review for Week 49 last week, so now you get a Death Star-sized video covering both Weeks 49 and 50. Also, we really could use your help to get us to a nice big number for the end of the project at the end of the year. When I started Wear Star Wars Every Day and selected Collateral Repair Project as the charity I wanted to raise funds and awareness for, I had no idea how long the project would end up going or how much money I would be raising for Collateral Repair Project’s work in helping urban refugees in Amman, Jordan with emergency assistance for food and heating, education and wellness programs, and community building. And now after nearly a year, I’m hoping to top $5,000 in funds raised – and we’re almost there! As of 12/20, we are at almost $4,300 with 11 days left in 2016 ($3,180 on GoFundMe, $1,167 from offline donations). Can you help in pushing us over the $5,000 mark? You can quickly donate via the GoFundMe, or contribute via other methods to Collateral Repair Project directly. I had originally set a very ambitious goal of $10,000 when I began this fundraiser, and would love to reach that goal, but I think that it would be awesome to finish strong at $5,000 or even higher. So if you’ve been on the fence or just had it on your to-do list but haven’t gotten around to it yet, now’s the time to make that tax-deductible contribution. *Cue Sarah McLachlan sad music* $20 is enough to provide a mattress to a refugee, while $50 is enough to provide a family of four refugees with food for a month. And I got a whole pile of cool prizes to reward those who donate from 12/21 to 12/31, including the leftover prizes from the November prize drawing and more! In the two weeks from December 2 to December 15, we had nothing but t-shirts, including a lot of unique designs. Thanks to Ian for donating several BustedTees.com shirts, and to Danielle and Stuart for lending some cool Star Wars wear. Plus I show off my custom shirts for my prequel movie premiere events as we head into the launch of Rogue One, with a shirt made just for the event. There’s a cool Disneyland shirt, and some treats from San Diego Comic-Con, and even a custom-printed Star Wars Customizable Card Game shirt of everyone’s favorite frog-dog, Bubo. And big thanks to our donors in this time period: Susan, Christine, Kristen, and Jennifer. All four of them made some solid contributions to boost our fundraising total to over $4,000 (roughly $2,900 on the GoFundMe and $1,100 in offline or direct donations). Every day I wear a new and different Star Wars apparel item, my daily pledge makers will chip in $4.65 to Collateral Repair Project! This review for Week 49 and Week 50 covers December 2 to December 15 of my wearathon, and an update on fundraising for and the latest happenings at Collateral Repair Project, a non-profit organization that provides emergency assistance, education, and community support to urban refugees. Plus, there’s soon going to be a way to help support Collateral Repair Project beyond 2016 – Soon, I’ll be putting up donated apparel on ebay with proceeds going directly to CRP. So this might be your chance to get your hands on some of the really rare threads I’ve worn that were donated to the project, including that sweet BB-8 lighter thumbs-up ladies tee from Star Wars Celebration Europe that I hinted that you could get your hands on, way back in August. I had hoped that I would have been able to start these auctions before the holiday season, but we’re still waiting for ebay to add Collateral Repair Project to their list of charity auction partners. Stay tuned! Star Wars: The Original Topps Trading Card Series, Volume One from Abrams ComicArts- Shauna R.
Star Wars: The Empire Strikes Back: The Original Topps Trading Card Series, Volume Two from Abrams ComicArts – Yacov F.
Star Wars: Return of the Jedi: The Original Topps Trading Card Series, Volume Three from Abrams ComicArts – Jen R.
Star Wars Galaxy: The Original Topps Trading Card Series from Abrams ComicArts – Danielle J. So how did Week 48 go? I wore a variety of shirts, including several related to different games, from foosball to Trivial Pursuit to the Bounty Hunt at Star Wars Celebration. And a big thank you to our donors in the Thanksgiving week: Nancy, Yacov, Jen, Shauna, and Danielle. We also give thanks to Mark and Ian who each donated a shirt in this week, and also wish to thank Dani who lent two of the shirts in this time period. Every day I wear a new and different Star Wars apparel item, my daily pledge makers will chip in $4.65 to Collateral Repair Project! This review for Week 48 covers November 25 to December 1 of my wearathon, and an update on fundraising for and the latest happenings at Collateral Repair Project, a non-profit organization that provides emergency assistance, education, and community support to urban refugees. Get more info on what Wear Star Wars Every Day is all about, or make a donation via GoFundMe or a per-day pledge. Wear Star Wars Every Day: Week 47 & Cyber Monday bonus! Celebrating Thanksgiving is what #WearStarWarsEveryDay is all about for Week 47! But more importantly, we have a special offer in our Thanks-for-giving prize drawing! If you donate to Collateral Repair Project via GoFundMe today, Cyber Monday, or tomorrow, Giving Tuesday, I will double your chances of winning a prize in the prize drawing! 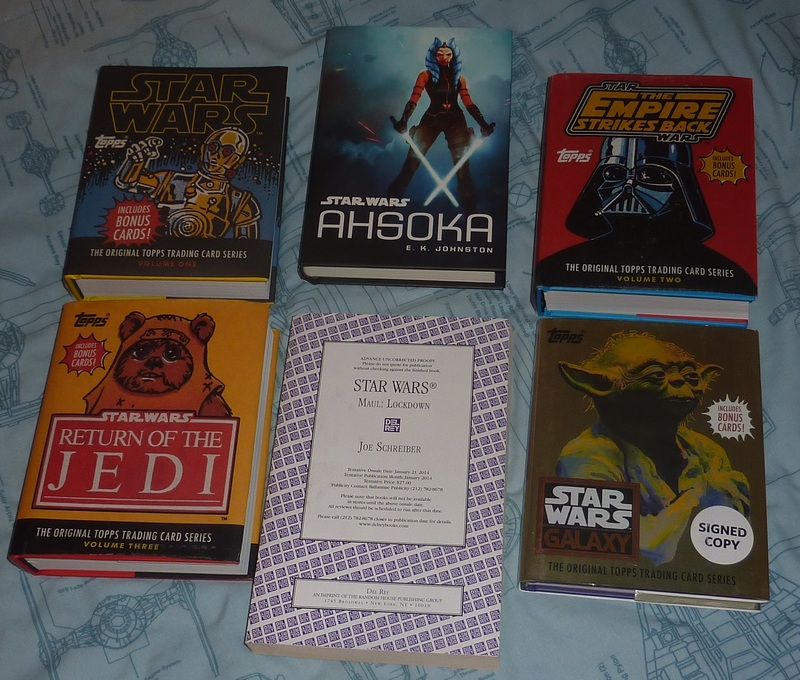 We have seven different prize packages to give away, including a set of four Topps Star Wars trading card series books, some of which are signed, a copy of Ahsoka signed by both the author E.K. Johnston and audiobook narrator Ashley Eckstein, and an advance uncorrected proof of Maul: Lockdown by Joe Schreiber. Just chip in $20 or more, and you’ll be entered into the prize drawings with double odds! Not even a Corellian gambler can give up those chances to win! (Especially since so few donations have been made, you’re practically guaranteed to win something!) All persons making donations through the end of November will be eligible for the different prize drawings, but your chances are doubled if you donate on 11/28 or 11/29! Back to week 47: I wear a variety of shirts, including an Adidas soccer jersey, and a Disney Cast Member exclusive stormtrooper helmet schematic tee. For this stretch of my fundraising campaign for Collateral Repair Project, we give thanks for a bunch of fine folks who lent me some wear this week, including Dani, Lori, Russell, and Trina. Plus a shirt I bought as a fundraiser for Make-A-Wish through the 501st Legion, so now it’s doing double duty! But sadly no donations in this time frame – makes for a sad turkey! Every day I wear a new and different Star Wars apparel item, my daily pledge makers will chip in $4.65 to Collateral Repair Project! This review for Week 47 covers November 18 to November 24 of my wearathon, and an update on fundraising for and the latest happenings at Collateral Repair Project, a non-profit organization that provides emergency assistance, education, and community support to urban refugees. Wear Star Wars Every Day: Week 46 – Hats off! #WearStarWarsEveryDay covers my noggin for all of week 46 with a run of headwear! For this stretch of my fundraising campaign for Collateral Repair Project, I put on a bunch of Star Wars hats, and give a tip of my top hat to our anonymous monthly donor, as well as to Kristen for donating one of the hats worn this week. Thanks also to James, who lent me four of the hats you’ll see in this recap, as well as Reynalyn and Todd. Don’t forget that as we approach Thanksgiving, you can still get entered into the Wear Star Wars Every Day Thanks-for-giving prize drawing for such cool prizes as a set of four Topps Star Wars trading card series books, a copy of Ahsoka signed by both E.K. Johnston and Ashley Eckstein, and more! Every day I wear a new and different Star Wars apparel item, my daily pledge makers will chip in $4.65 to Collateral Repair Project! There’s a couple of baseball caps, including two from the 501st Legion, and a bucket / fishing hat and a homemade crochet Artoo beanie with tassels! This review for Week 46 covers November 11 to November 18 of my wearathon, and an update on fundraising for and the latest happenings at Collateral Repair Project, a non-profit organization that provides emergency assistance, education, and community support to urban refugees. Wear Star Wars Every Day: November Thanks-for-giving prize drawing! Just like your local PBS station, it’s time for another donation drive for Collateral Repair Project via #WearStarWarsEveryDay! We can’t do it without the support of viewers like you! With Thanksgiving on the horizon, I’m turning the rest of the month of November into a big Thanks-for-giving promotion with a huge pile of prizes available to good people who donate to help Collateral Repair Project in their goal of providing emergency assistance, education, and community support for urban refugees in Amman, Jordan. Donate at least $20 to the Wear Star Wars Every Day GoFundMe from November 14 to November 30, and you’ll be entered into prize drawings for some very cool Star Wars book prizes, including some awesome titles from Abrams Books! A set of four Star Wars Topps trading card series books from Abrams ComicArts. 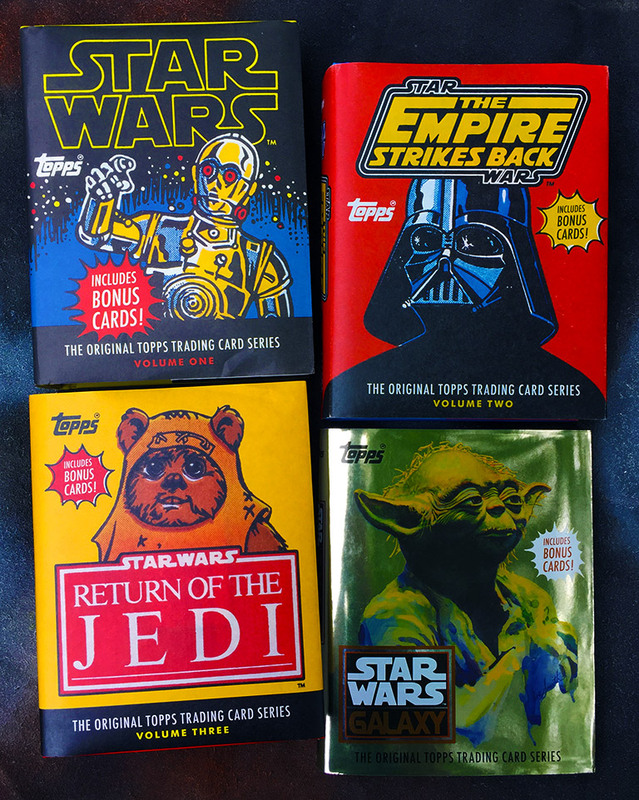 These books contain the artwork of the full sets of the original Topps trading cards for Star Wars, The Empire Strikes Back, Return of the Jedi, and Star Wars Galaxy trading card sets. Plus each book contains a packet of bonus cards. Plus, the Return of the Jedi book and Star Wars Galaxy book are signed by the author of the introduction and commentary, Gary Gerani, the original editor of the Star Wars Topps series. This four book set will go to a random donor who donates at least $75 on the GoFundMe from 11/14 to 11/30. A signed copy of Star Wars: Ahsoka by E.K. Johnston from Disney Lucasfilm Press. The new Ahsoka young adult novel, signed by both the author, E. K. Johnston, and the voice of Ahsoka Tano and audiobook narrator, Ashley Eckstein. This book will go to a random donor who donates at least $40 on the GoFundMe from 11/14 to 11/30. Star Wars: Maul: Lockdown Advance Uncorrected Proof by Joe Schreiber from Del Rey. This advance copy of Maul Lockdown was published in 2013 for advance reviewers and others prior to the novel’s hardcover release in January 2014. This uncorrected proof will go to a random donor who donates at least $40 on the GoFundMe from 11/14 to 11/30. Star Wars: The Original Topps Trading Card Series, Volume One from Abrams ComicArts. At nearly 550 pages, this volume reprints all the original Topps Star Wars trading cards from 1977 and 1978 – all five sets, including sticker cards. Plus it also covers the Wonder Bread Star Wars trading cards and comes with a pack of four bonus trading cards. This 2015 book will go to a random donor who donates at least $20 on the GoFundMe from 11/14 to 11/30. Star Wars: The Empire Strikes Back: The Original Topps Trading Card Series, Volume Two from Abrams ComicArts. This volume reprints all the 1980 Topps trading cards for The Empire Strikes Back, all three sets, sticker cards, and giant photocards. Plus it comes with a pack of four bonus trading cards. This 2016 book will go to a random donor who donates at least $20 on the GoFundMe from 11/14 to 11/30. Star Wars: Return of the Jedi: The Original Topps Trading Card Series, Volume Three from Abrams ComicArts. This volume reprints all the 1983 Topps trading cards for Return of the Jedi, both sets, sticker cards. Plus it comes with a pack of four bonus trading cards and contains a signed and numbered bookplate by Gary Gerani, the original editor of Topps Star Wars trading cards and author of the book’s introduction and commentary. This 2016 book will go to a random donor who donates at least $20 on the GoFundMe from 11/14 to 11/30. Star Wars Galaxy: The Original Topps Trading Card Series from Abrams ComicArts. This volume reprints all the Topps trading cards in the Star Wars Galaxy trading card series from 1993 to 1995 showcasing original art from a lot of big names in comic, movie and fantasy art. Plus it comes with a pack of four bonus trading cards and contains a signed bookplate by Gary Gerani, the original editor of Topps Star Wars trading cards and author of the book’s introduction and commentary. This 2016 book will go to a random donor who donates at least $20 on the GoFundMe from 11/14 to 11/30. Drawing will be held in early December, and all prize winners will be notified by email. 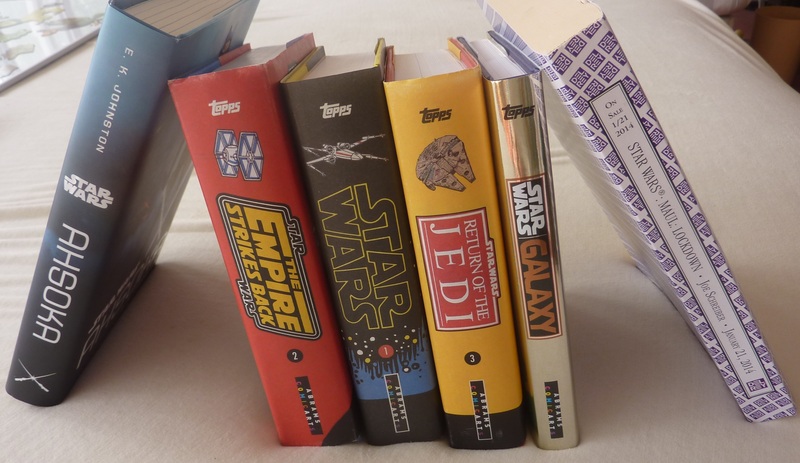 Star Wars Topps Trading Card books generously donated by Abrams Books. Good luck! Remember that your donations help Collateral Repair Project, a non-profit that provides assistance, education, and community support to urban refugees. Learn more about Wear Star Wars Every Day! Thanks for giving to Collateral Repair Project via Wear Star Wars Every Day! Week 45 of my #WearStarWarsEveryDay fundraising campaign is all wrapped up, and we’ve got a wacky mix of Star Wars wear for this first full week of November. No donations for Collateral Repair Project in this time period, which is a bit of a bummer, but I know that with the election in the US, everyone’s mind has been elsewhere. Still, big thanks to Trina who donated a shirt worn this week, and Danielle who lent four of the items donned this week, along with Tyler who lent another wrist sweatband. Every day I wear a new and different Star Wars apparel item, my daily pledge makers will chip in $4.65 to Collateral Repair Project! This time around, we have six shirts from a variety of companies, including my Back to Jakku mashup shirt from Teepublic for Back to the Future Day. There’s also Tyler’s wristband which I wore to jury duty, and a warning sign for our favorite stormtrooper in A New Hope. This review for Week 45 covers November 4 to November 10 of my wearathon, and an update on fundraising for and the latest happenings at Collateral Repair Project, a non-profit organization that provides emergency assistance, education, and community support to urban refugees.